There are two versions of this hike. 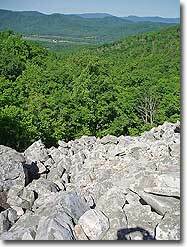 The first passes the Devil's Marbleyard, a hillside of boulders with some as large as a truck, and continues down the Gunter Ridge Trail. 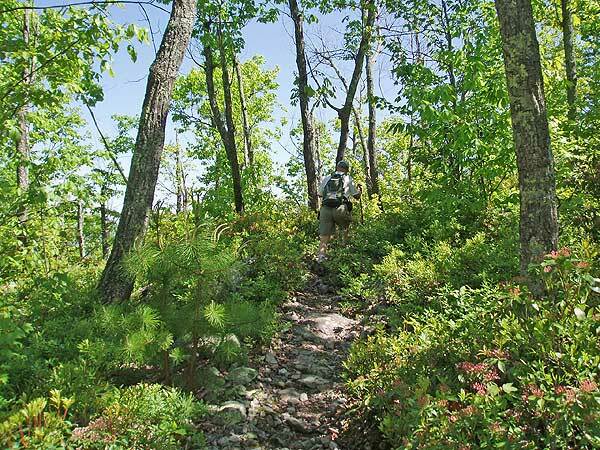 The second version adds a 3.0 mile out and back hike along the Appalachian Trail, which reaches one of the most spectacular 360° panoramas in Virginia. From the parking area cross the footbridge over the east fork of Elk Creek on the blue blazed Belfast Trail. 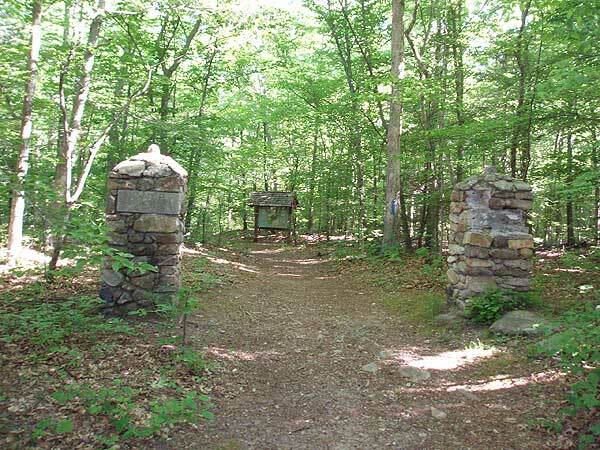 Pass the stone pillars of the old Powhatan summer camp, and in 100 yards cross the intersection of the Glenwood Horse Trail (GHT). 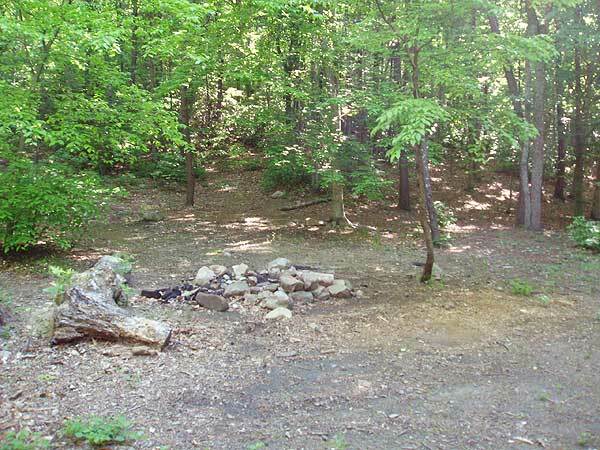 Continue straight and in 200 yards there is a large camping area among what's left of the Powhatan Camp building foundations. The Belfast Trail trail veers left here, crossing a creek, then arriving at another junction of the GHT. Stay right following the blue blazed Belfast Trail. From this point there are no further blazes along the Belfast Trail. 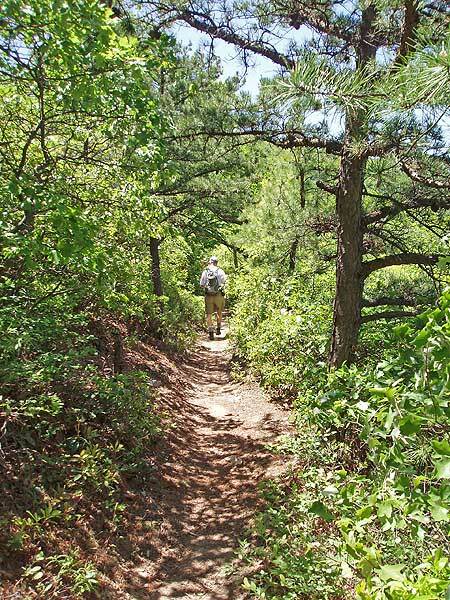 The trail will become steeper crossing a stream two more times before reaching the bottom tip of Devil's Marbleyard in 1.0 miles. 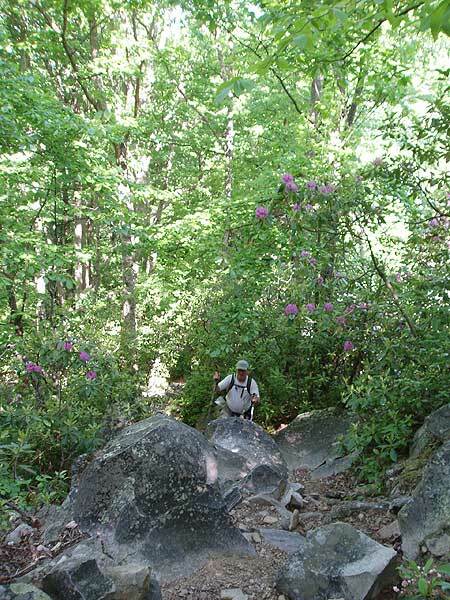 The trail stays to the right of Devils' Marbleyard, and in 0.1 miles there is access through the scrub to the main boulder field. 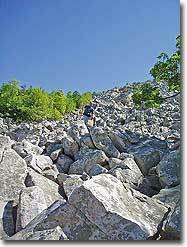 If you spend some time rock-hopping make sure to rejoin the Belfast Trail at the same point you entered, as there isn't any trail access higher in the boulder field. 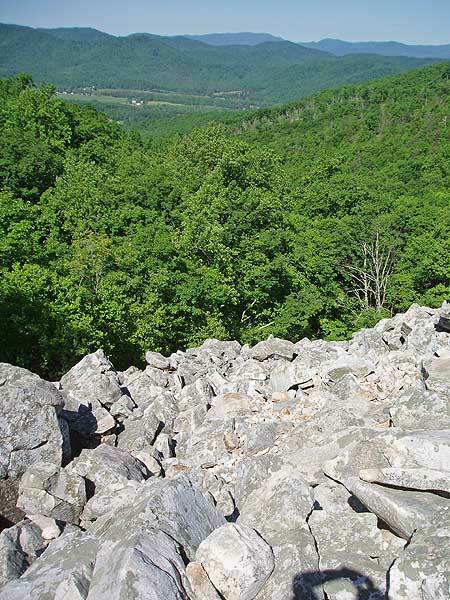 Continue up the Belfast Trail as it veers away from Devil's Marbleyard through a ravine, then arrives at the top of the ridge and junction of the Gunter Ridge Trail in 0.9 miles. 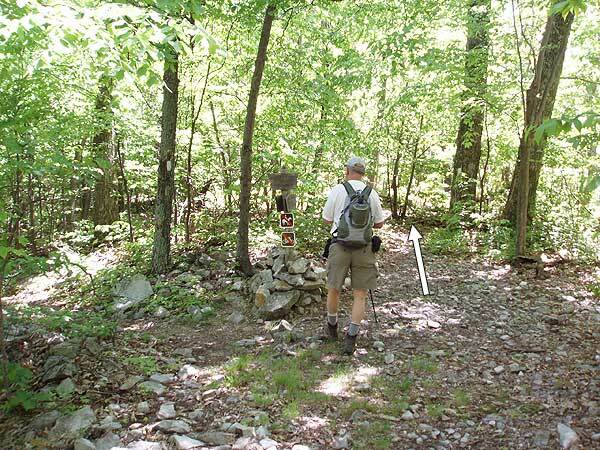 Turn right and in 0.5 miles reach the end of the Belfast Trail and intersection of the Appalachian Trail (AT). Stay right along the ridge on the now white blazed AT as it continues down to the right, through a small saddle, and back up before arriving at a 100 yard clear section of the AT. 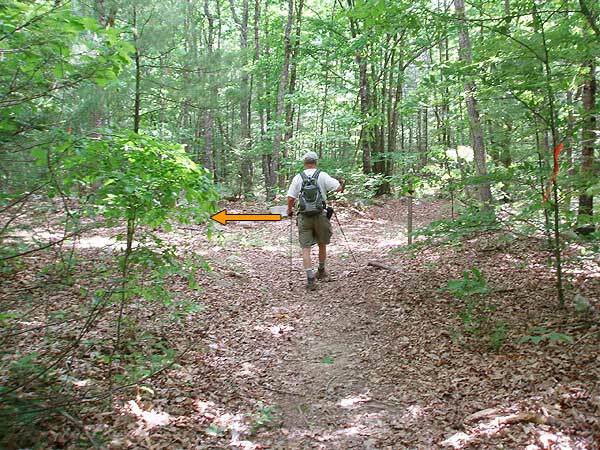 Just before the open area of the trail reenters the tree line turn left uphill through the underbrush, and in 30 yards reach the ridge. 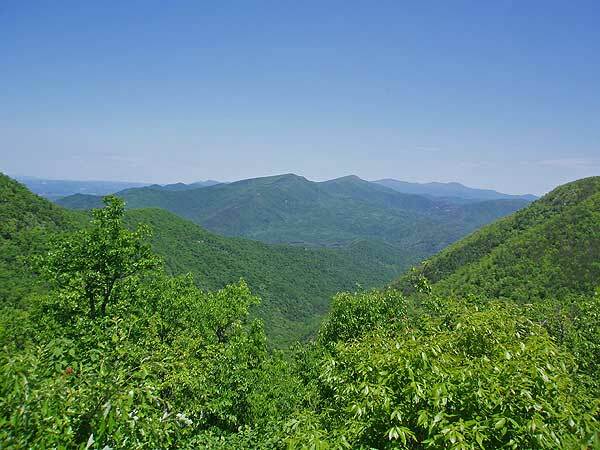 This clearing, along the un-maintained Sulphur Spring Trail, is known as the 'Helicopter Pad', and has one of the most spectacular 360° views in the state of Virginia. 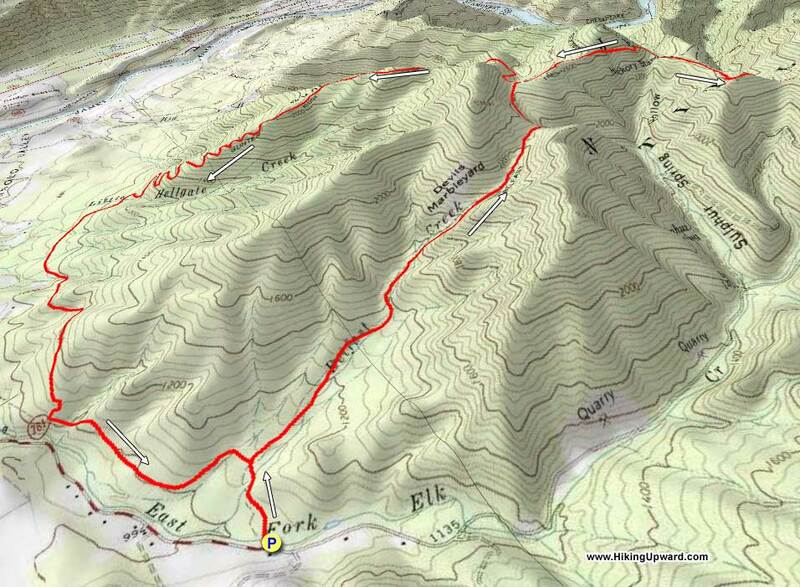 To continue, retrace the route 1.5 miles back to the intersection of the Gunter Ridge Trail you passed earlier. 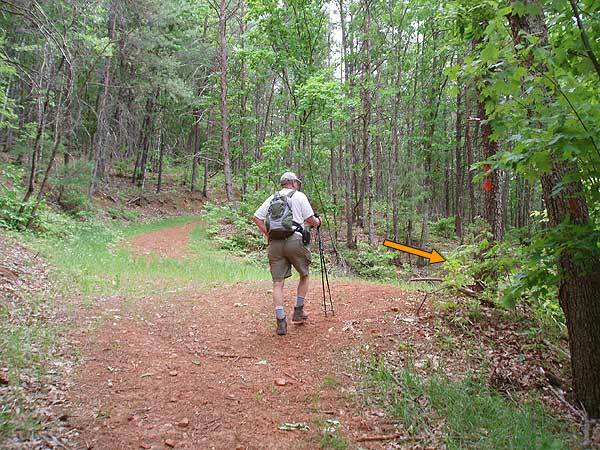 If you are hiking the shorter loop only, turn left on the Gunter Ridge Tail. 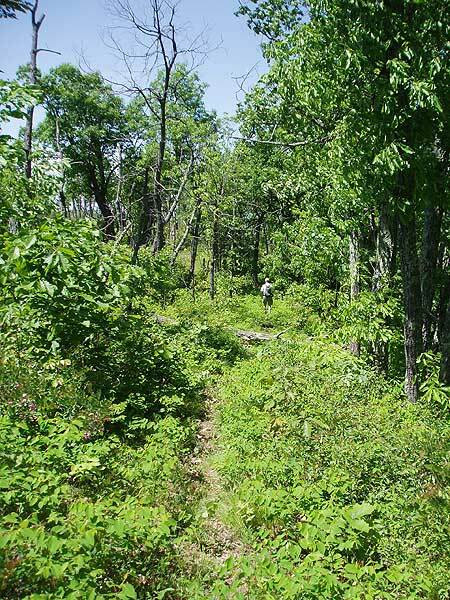 For the the out/back addition on the AT, now continue straight on the Gunter Ridge Trail. 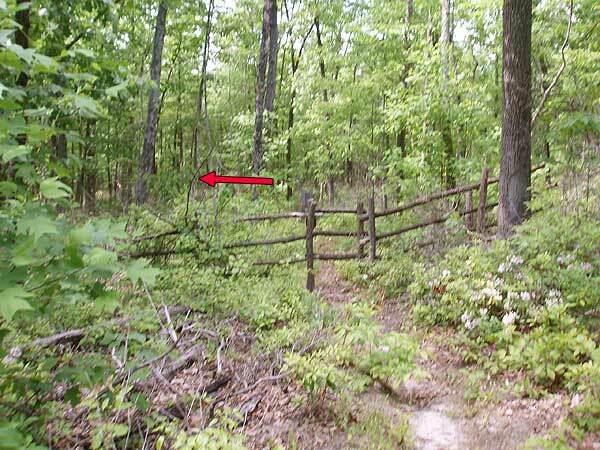 The Gunter Ridge Trail is not blazed, and is marked on the map here in red. 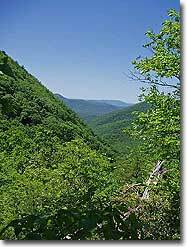 In 0.3 miles pass through a small saddle, then descend along the north side of the mountain before the trail heads back to the ridge line. Once along the ridge there are views in every direction. 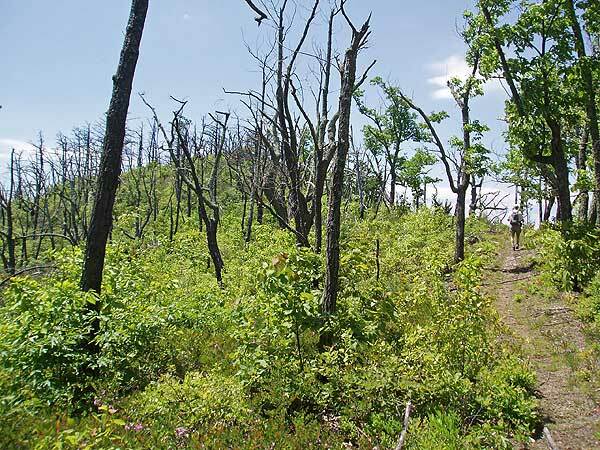 A fire, caused by lightning, burnt this section of Gunter Ridge in 2002 and almost no large trees remain. Begin to descend more steeply, and the trail makes 14 switchbacks before leveling out near the valley floor. 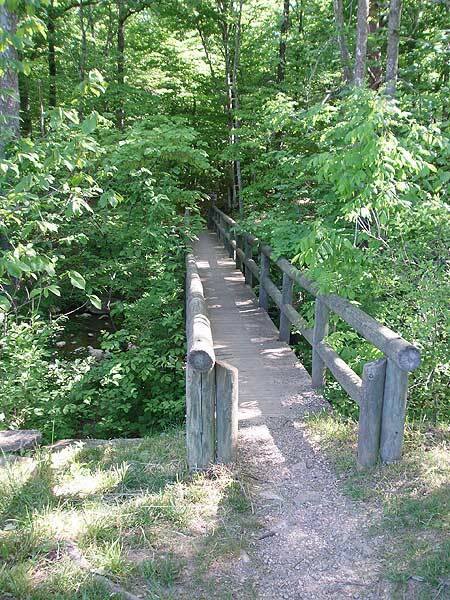 Pass through a wooden horse gate and follow the trail to the left. Cross Little Hellgate Creek, and in 0.5 miles the Gunter Ridge Trail ends at the Glenwood Horse Trail (GHT). 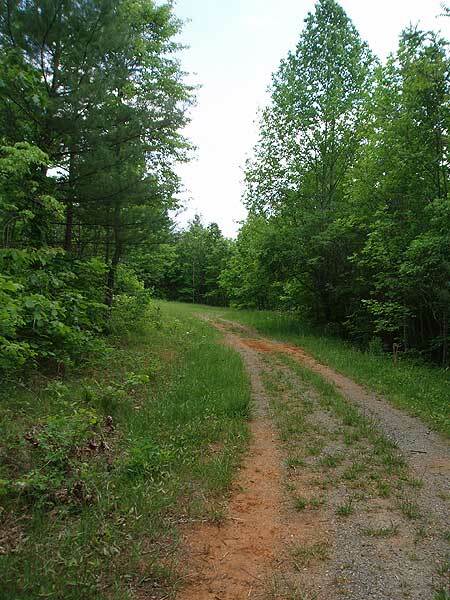 This section of the GHT is an old forestry road. Turn left on the orange GHT. There aren't any trail markings on the GHT at this point, so don't be concerned if you don't see any. 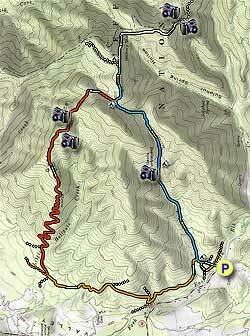 The GHT will wind around the mountain, then in 0.8 miles stay right following the orange diamonds where a side FS road leads uphill. In 0.3 miles pass another FS road that turns back to the left, and 200 yards further make a sharp switchback to the left continuing to follow the orange diamonds. 0.8 miles from here the GHT reaches the intersection of the Belfast Trail you ascended earlier. Turn right, and in 60 yards stay right again following the orange diamonds. 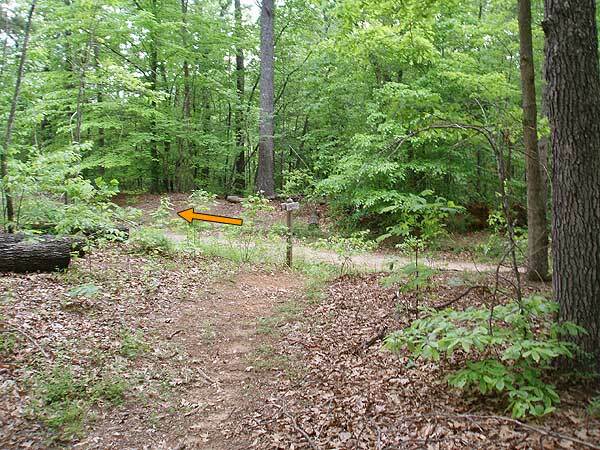 In 240 yards turn left at the arrow and orange diamonds, cross a small stream, and in 300 yards reach the intersection of the Belfast Trail. Turn right on the Belfast Trail for 100 yards re-crossing the east fork of Elk Creek and arrive back at the parking area. Fun and pretty hike. After heavy rain, one section of the Belfast Trail adjacent to the Marbleyard was overrunning with water--a bit slick to traverse a steep upward section...probably easier to stay in the Marbleyard then move back to Belfast trail after the first main pitch. 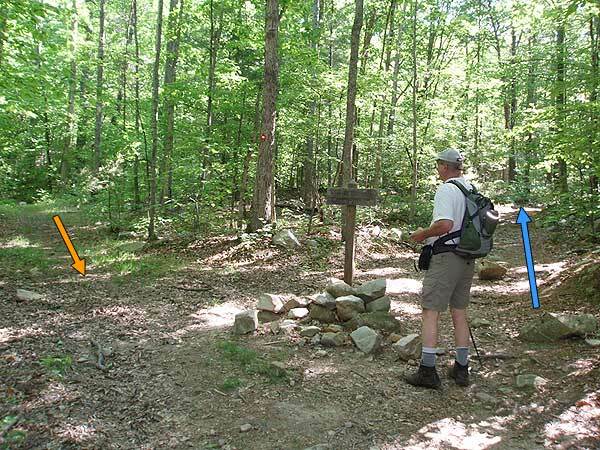 There are a few entrance/exit point between Belfast Trail and the large boulder field. The last one is about 1/2-2/3 way up the boulder field. 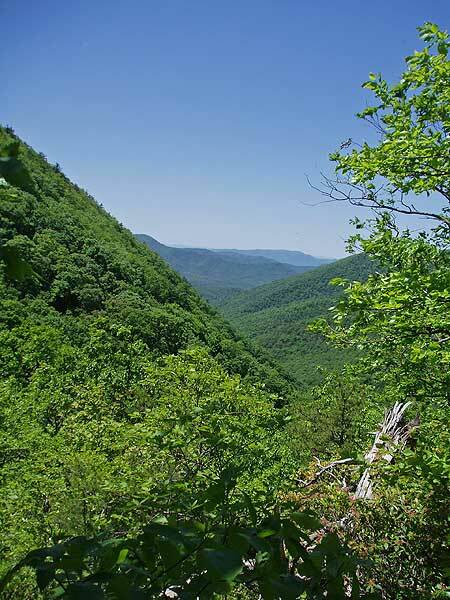 The views along the AT section were especially nice in early spring--lmillions of little green specks just leaving off, big views to the hollow/valley. The turn-off the AT to the helicopter pad is fairly easy to miss/not particularly distinct---a bit of shale packed down in a ~3ft clearing (as indicated in the photo on hiking upward). 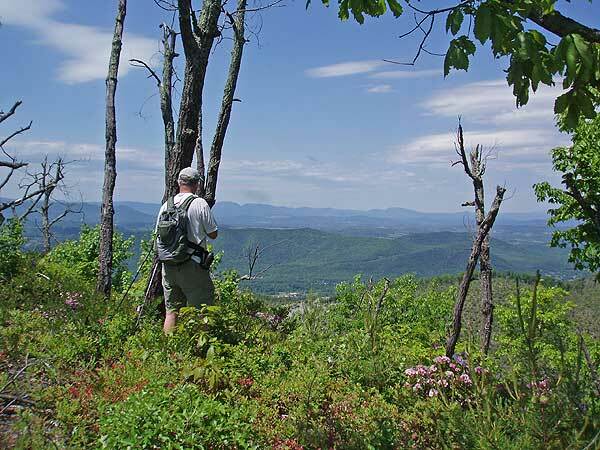 AT eventually intersects Piney Ridge Trail after another ~1mi on the AT. Some options to make a massive loop there. I'm wondering if they have rerouted the Gunter Ridge trail. When we got to the top, the trail going up and to the left disappeared after a few feet. However, there was a trail that went kind of straight ahead and down. We decided to follow that one a little bit to see where it went, and it turned out to be the right one. It looks like it now goes around the mountain instead of up it, and the trail seemed to be well maintained. Also, had I not been with someone who had been there before I don't think I would have understood that the actual trail goes beside the rockpile instead of over it. 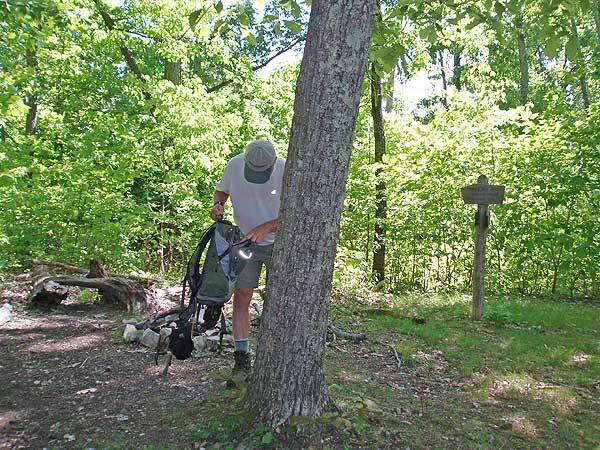 That was a little difficult to see as well since there didn't appear to be any trail markings. The trail beside the rockpile was very pretty going up a stream. 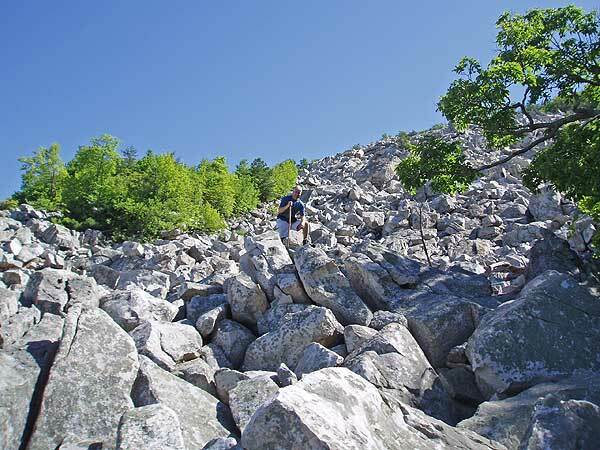 Yes, climb on the rockpile, but be sure not to miss the trail beside it. 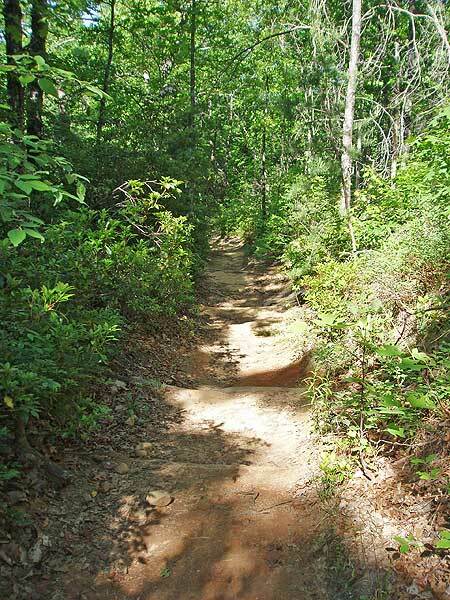 We did things a bit different to avoid the tick-fest on Gunter Ridge Trail but still do some semblance of a loop. We dropped a car at the Marbleyard parking lot and drove up to the Sulfur Ridge trail head (N37.56424° W79.45423°). This is NOT the same as the Sulfur Springs trail head which you'd pass enroute to our starting point. 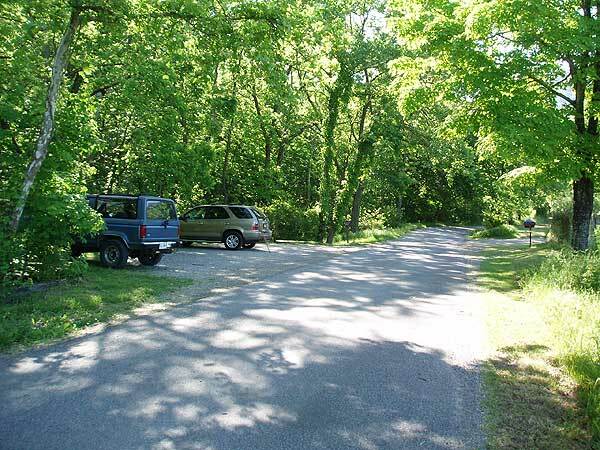 There is no designated parking at Sulfur Ridge but ample room on the south side of Petite's Gap Road for a couple of cars. 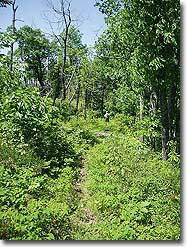 The trail is not well-maintained (a few blowdowns) but it pleasant and passable. The hike involved 1.2 miles on the Sulfur Ridge trail, then 0.9 miles on the AT(northbound) to 5-Points, 1.2 miles on Sulfur Springs Trail (northbound) to the Helicopter Pad (no views per se), another 1.1 miles on the AT and finally to 2.9 miles on the Belfast Trail back to the Marbleyard parking lot. 7.3 miles, 1,000' ascent, 2,200' descent and you pass the Marbleyard on your right on the way down. The Marbleyard itself is pretty amazing. A pretty easy hike until you approach the Marbleyard where the Belfast Trail becomes pretty steep and rocky. I'd avoid doing this hike in any configuration after a rain as the trail could become very slick. I'd also avoid Gunter Ridge unless you have an open-ended Doxycycline prescription. All in all, a good hike but the descent down the Belfast Trail is very slow and rugged. On paper, 2-star difficulty but the rocky descent probably bumps the difficulty to 3 stars. I hiked the 8-mile version on a beautiful fall day with some friends from Central Virginia Trailblazers. We had fun playing in the marbleyard and enjoyed the limited but nice views along the Gunter Ridge Trail, which is not as well traveled. (Wear long pants and avoid doing this in the summer!) We ran into a ranger near the end of the hike, and he was very impressed that we did the full loop (as opposed to just hiking to the marbleyard and back). We had no trouble parking, but by the time we left, lots of cars were parked along the shoulder on Petites Gap Road. After the hike, we couldn't resist checking out "Dinosaur Kingdom II", which was hilariously bad - don't pass this by! Then we had a great dinner at Pink Cadillac Diner before heading home. Hiked the Marbleyard taking the Belfast Trail (Blue) to the marble yard. 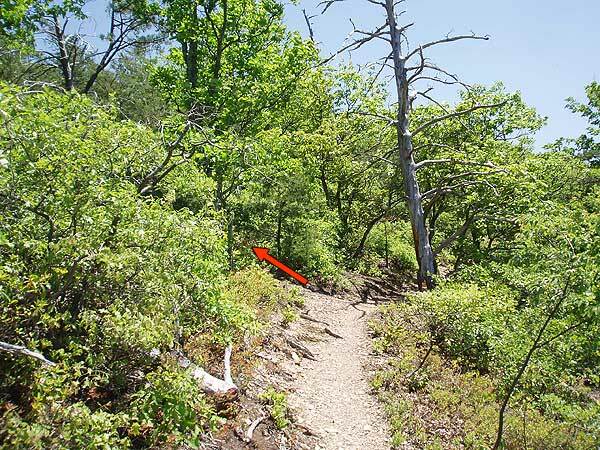 The trail was in good condition, and then took the trail up the steep path along the marble yard to the fork of the Gunter Ridge Trail (red). The path after the marble yard is less maintained and we had to go around a fallen tree at one point. Camped at the fork along the AT and it is good to note that there is no water sources along this hike except for the two streams close to the trail head. 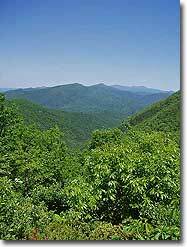 We hiked to the two cameras at the end of the AT trail shown on the map and we did not see the helipad. Another group informed us that they did not really find anything worth seeing. We hiked the Gunter Ridge Trail (red) back and it was not maintained for a good amount of the trail. Walked through a lot of brush and spiders. 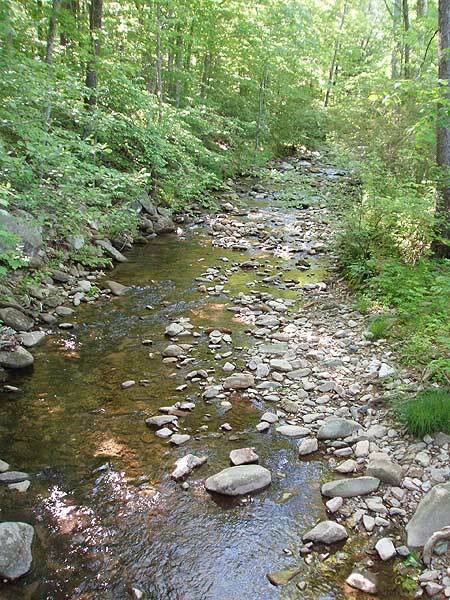 There was a stream right before the trail joins the Glenwood Horse Trail (GHT). If I knew the trail was not maintained I would have just gone back the BT instead, but it was a journey to help appreciate what a maintained trail is like.